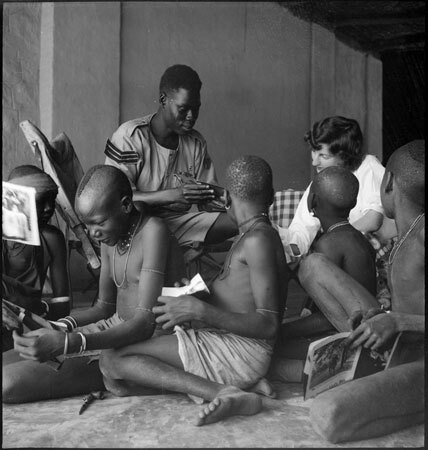 Jean Buxton with a group of Mandari girls and her Mandari police sergeant, Makelele Nyayo (who was charged with looking after her personal safety) looking at pictures in magazines together. It seems likely that this is Buxton's own room, with her bed visible in the background. It is possible that the photograph was taken by her academic supervisor Godfrey Lienhardt who visited her during her fieldwork in 1950. Morton, Chris. "Buxton showing magazines to Mandari girls" Southern Sudan Project (in development). 03 Jan. 2006. Pitt Rivers Museum. <http://southernsudan.prm.ox.ac.uk/details/1998.97.568/>.